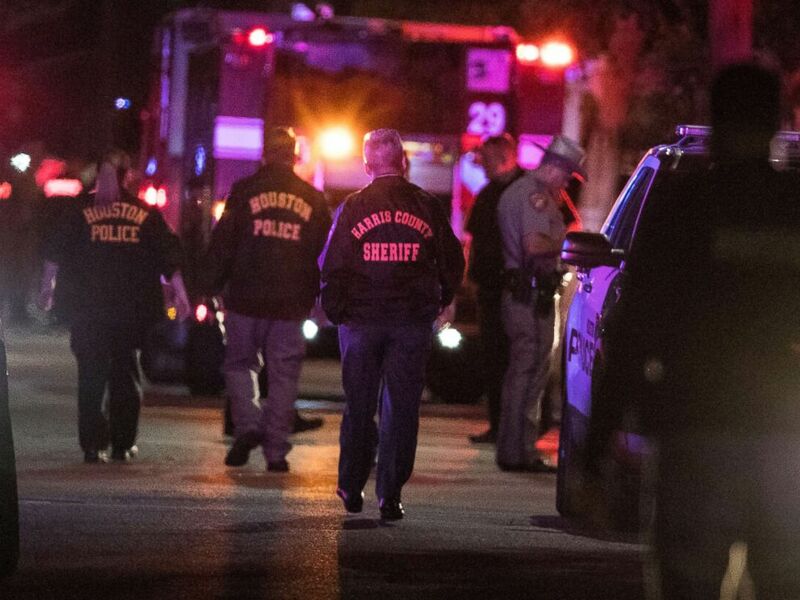 A 58-year-old woman was among of pair of suspects shot dead by undercover police during a raid on a suspected Houston drug house that left five officers injured, including two who were shot in the face, officials said Tuesday. Two of the wounded officers remained in critical but stable condition Tuesday at Memorial Hermann Hospital in Houston. 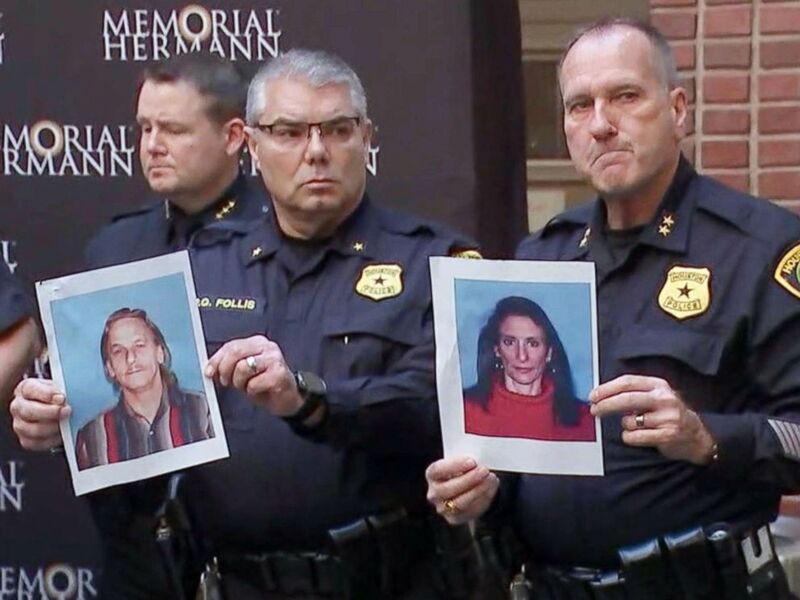 Houston police officers hold the photos of two suspects in the shooting of five police officers during a press conference at a hospital in Houston, Jan. 19, 2019. The suspects were identified as Dennis Tuttle, 59, and Rhogena Nicholas, 58. Acevedo identified the two suspects who were shot and killed during the raid as 58-year-old Rhogena Nicholas and 59-year-old Dennis Tuttle. He did not identify the injured officers but said they are all veterans of the Houston Police Department and range in age from 32 to 54. He said that four officers suffered gunshot wounds and a fifth officer sustained a serious knee injury that required surgery. Acevedo said the drug raid on the southeast Houston home stemmed from numerous complaints from neighbors. He said undercover officers had previously made two purchases of black tar heroin from drug dealers at the house. 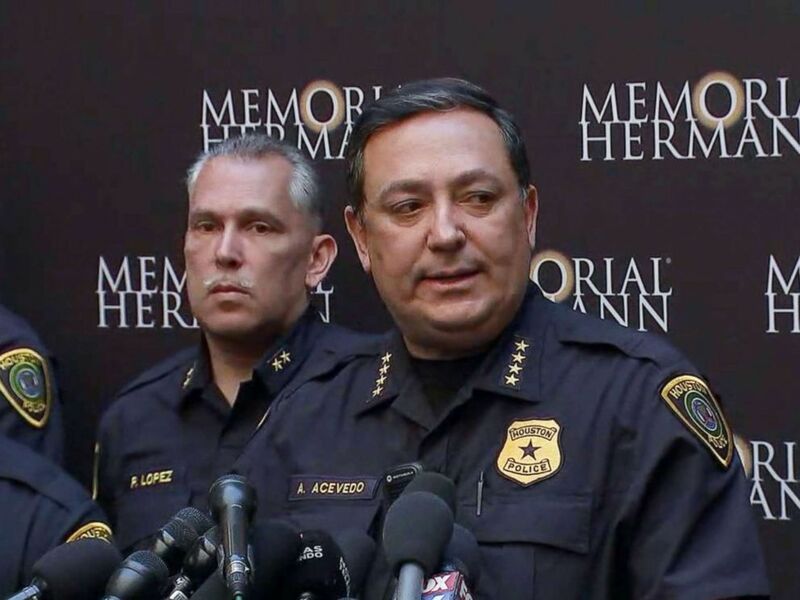 Houston police Chief Art Acevedo speaks about the shooting of five police officers during a press conference at a hospital in Houston, Jan. 19, 2019. Armed with a search warrant, nine narcotics detectives backed up by at least six patrol officers surrounded the home on Harding Street just before 5 p.m. on Monday. One of the suspects, Tuttle, charged from the back of the house firing a .357-caliber Magnum revolver at the officer, hitting him in the shoulder. He’s a big teddy bear … The only thing bigger than his body in terms of stature is his courage. I think God had to give him a big body just to be able to contain his courage. Acevedo said officers opened fire killing Nicholas and engaged in a gun battle with Tuttle. He said the lead investigator who breached the door, entered the house and was also shot. 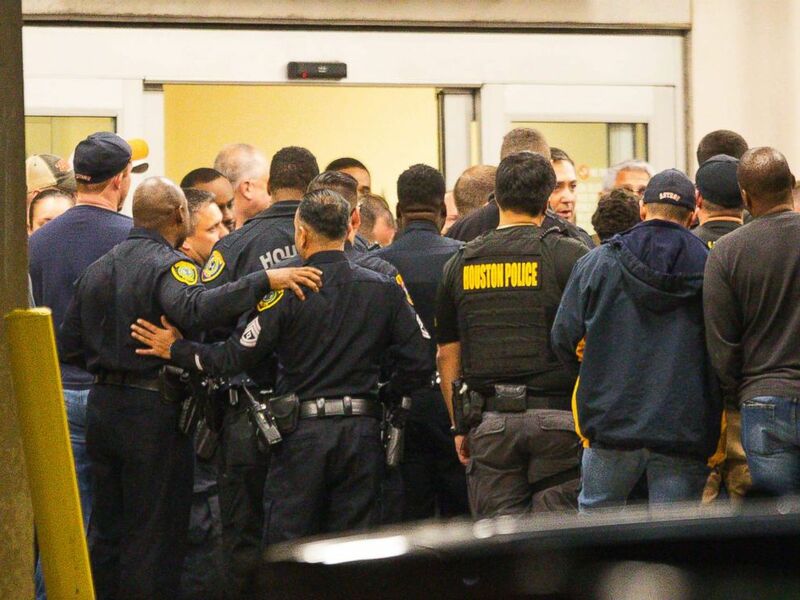 Officers listen as Houston Police Chief Art Acevedo comes outside of the emergency department at Memorial Hermann Hospital after visiting injured officers in the Texas Medical Center, Jan. 28, 2019, in Houston. “After we had two officers down and another shot, the remaining officers … started laying down cover fire, left positions of cover themselves and, I believe, they heroically pulled their fellow officers out of harm’s way,” Acevedo said. He said Tuttle followed the retreating officers to the front door and continued to fire at them before he was shot and killed. Police recovered two shotguns and three rifles from the residence and seized marijuana and a white powder they believe to be either cocaine or the powerful synthetic opioid fentanyl, Acevedo said. He said it was the third time in 25 years that the 54-year-old lead investigator on the case had been shot in the line of duty. He said the officer was previously shot in 1992 and again in 1997. He said at least four other officers opened fire during the firefight with Tuttle. They have all been placed on paid administrative leave while the incident is under investigation. Acevedo declined to discuss the criminal backgrounds of Tuttle and Nicholas, saying that will be part of the investigation. He also said police are investigating electronic surveillance in the home that might have tipped off the suspects to the raid in progress. Police investigate the scene where several Houston Police officers were shot in Houston on Monday, Jan. 28, 2019. “A lot of drug houses have surveillance systems that are better than businesses,” Acevedo said. He said the shooting again proves just how dangerous law enforcement work can be. “We are sick and tired of having dirtbags trying to take our lives when all we’re trying to do is protect this community and protect our families,” Gamaldi said during an emotional news conference. They offer a lot of prayers, but we didn’t elect people to pray for us. We elect people to lead us. We elect people to make public policy decisions. So to the elected officials, I appreciate your prayers but quite frankly we’ve got a community that prays for us. Acevedo said Tuesday that he understands Gamaldi’s frustration. He described gun violence in America as “a public health epidemic” and said it is up to elected officials to finally get serious about tackling the problem.